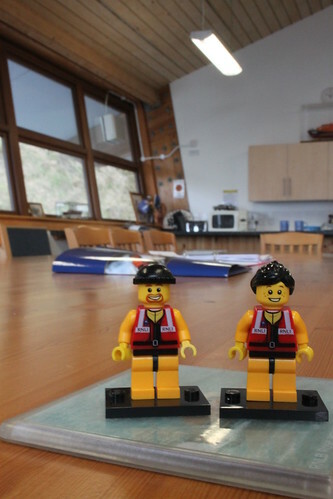 Having made their way carefully down the 45 metres of steps between the top of the cliff and the boathouse, the Crew were keen to get in out of the drizzling rain and the blustery wind. And it was with considerable excitement that we pulled open the entrance door and stepped inside. Our first thought was, simply, ‘wow’. The boathouse looked fairly impressive from outside, but from inside it was absolutely amazing. 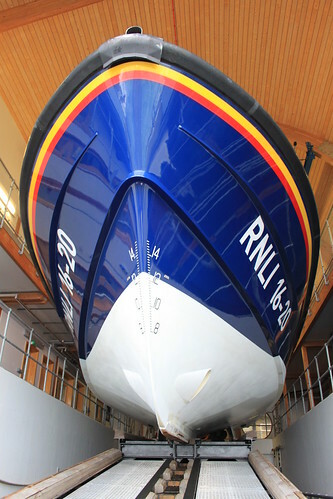 The wooden roof supports curved gracefully above our heads and before us sat the station’s mighty Tamar class lifeboat ‘Rose’, poised to rocket off down the slipway at a moment’s notice. It was extremely quite in the boathouse and we could see no indication that there was anyone around. ‘Hello…’, I yelled, to nobody in particular. ‘Oh, hello’. A figure detached itself from the Tamar’s superstructure, paintbrush in hand. It was Dan, the station’s mechanic, who had heard that we might be popping in and was keen to meet the Crew. After introductions all round, Dan took us to meet Andrew, the station’s Coxswain, who was at his desk in the crew room, catching up on some paperwork. 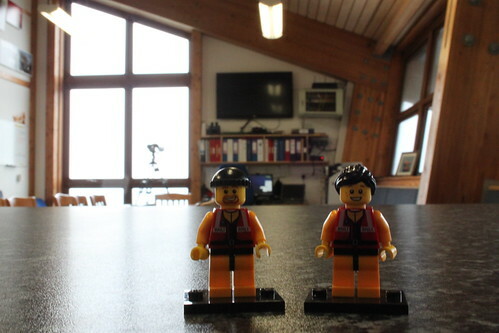 The little guys were massively impressed with the crew room, with its ample work space, meeting area and small kitchen. Keen to learn about the station and its crew, we had a very pleasant cuppa and a chat with Andrew and Dan. And the little guys – and Molly – made themselves right at home. The view from the crew room was spectacular, looking out over the waves. 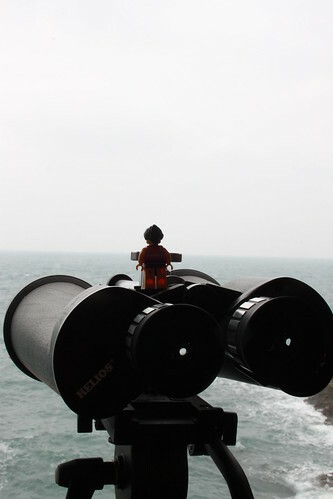 Crew Member Jackie took her turn on watch, keeping an eye out for passing yachts and commercial traffic. Thankfully, although the weather was a bit rough, things were looking fairly quiet. Dan kindly offered to give us a tour of the station. 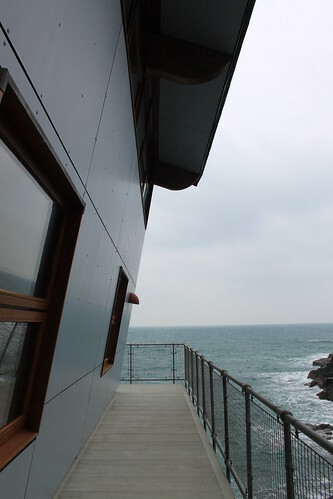 With the boathouse only having been completed in 2011 (which is practically yesterday in Cornish terms), he admitted that the crew were still getting used to things. But both he and Andrew were clearly immensely proud of their station, their boat and their fellow crew members. 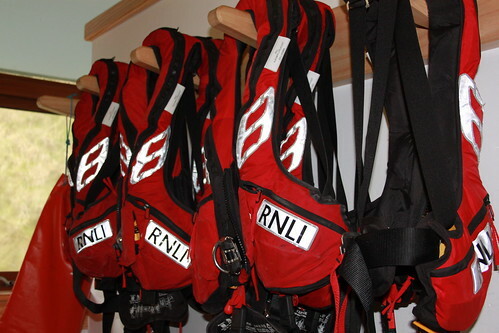 He also showed us the crew’s changing area, where all of their kit was hung neatly, ready to be donned at a moment’s notice. 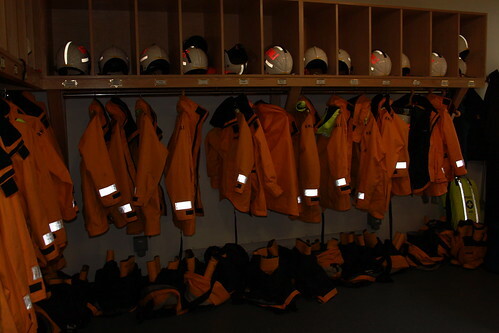 The station has around 25 crew members, as well as shore crew and other volunteers. It became quickly apparent, in fact, that practically everybody living or working within a few miles’ radius of the station was involved with it in some way. However, with local employment opportunities dwindling, many members of the crew have to travel to the nearby town of Helston – or beyond – to work. This can make it difficult to manage crew availability, a situation which is exacerbated by the lack of affordable housing in the local area. It’s a problem faced, no doubt, by many stations in this part of the world. But it is a challenge to which the Lizard station has risen defiantly, with the lifeboat always being able to launch when called upon. From the changing room, we headed down to the slipway and to the lifeboat herself. The shiny blue hull of the ‘Rose’ towered above our heads. 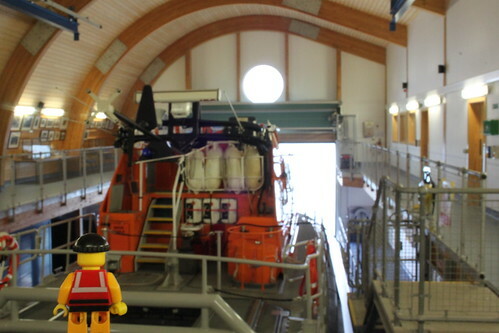 And I must confess to feeling more than a little nervous as I stood on the slipway in front of 32 tonnes of lifeboat. 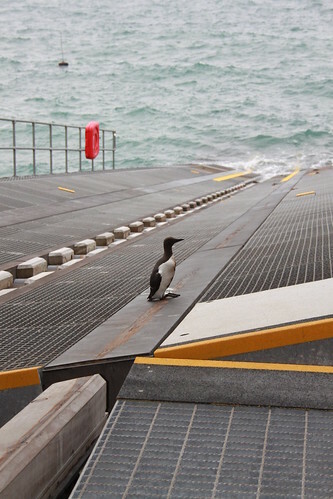 Having looked around the boathouse, it was now time to look on board the ‘Rose’ herself. And so it’s onto the station’s Tamar that we’ll head in next week’s blog post.